Incredible Riverfront Home 5 minutes from downtown Durango! House on 8 private acres of Riverfront, just 5 minutes to Downtown Durango, 25 Minutes to Ski Area, 20 minutes to airport or land your own plane a mile away! Welcome to Rio Angels' Retreat! Enjoy eight gorgeous acres of private river-front property only five minutes from downtown Durango, Colorado. Here you will find two fully furnished homes, situated steps from the river amidst beautiful trees and enchanting landscaping. Each house boasts its own outdoor stone firepit, picnic areas, and a fabulous riverside nature trail that runs the length of the property. Surrounded by the majesty of the La Plata Mountains, the soothing sounds of nature and the view of the Animas River flowing through the front yard, the Rio Angels property is sure to inspire good times and relaxation for everyone. Rio Angels is a beautiful riverfront estate on the Animas River. Located just 5 minutes from downtown Durango, Colorado and in easy driving distance of three great ski areas, this hidden treasure is close to all that Durango has to offer, yet is tucked away in a private country setting surrounded by stunning mountain views and 1600 feet of private water with fabulous fishing. There are two wonderful houses on the estate; Ariel's Nest sleeps 4-6 and Gabriel's Cabin sleeps 6 - 8. Both houses offer multiple river-front decks, as well as outdoor firepits and outdoor seating areas overlooking the Animas River. Both homes have central heat & air, are fully furnished and offer a well equipped kitchen, laundry room, hi-speed wireless internet, satellite TVs, and much more! The homes are far enough apart for our guests' privacy or can be rented together for large groups and events. Far enough to get away from it all, yet only 5 minutes from the fabulous sites, restaurants and shopping of downtown Durango and a great starting point for all the hiking, fishing, hunting, rafting, skiing, biking and exploring the Four Corners area has to offer, Rio Angels is the perfect place for the whole family. We also offer complimentary day passes to the Durango Recreation Center for our guests to enjoy indoor activities such as swimming, lazy river, hot tub, climbing wall, workout facilities, etc. Ask us about our great deals for weddings, company picnics, business seminars, hunting and fishing parties, group retreats, and family reunions. Enjoy breathtaking views of Durango's gorgeous Purple Cliffs and explore the countless hike and bike trails, National Forests, fishing, skiing, hunting, and adventure opportunities in the area. 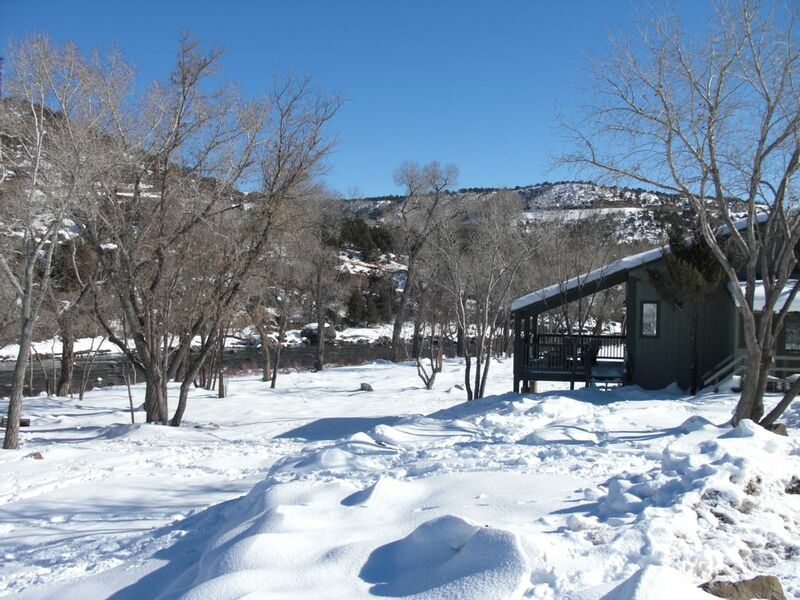 Enjoy the sights and sounds of the beautiful Animas River flowing through the front yard. Rio Angels guests will enjoy private access to the river and 2 beaches perfect for fishing, swimming & tubing. Rio Angels' huge front lawn leads down to the Animas River and is perfect for weddings, corporate picnics, and family reunions. Complimentary day passes to Durango Recreation Center with pools, hot tub, gym, workout room, climbing wall, splash pad & much more - and FREE childcare for guests using the facilities! We really enjoyed our stay at this cozy cabin! It was very clean, nice and had everything we needed. I would definitely stay here again! We just spent 5 days at Gabriel’s Cabin. It was perfect! The cabin was clean, well stocked with the essentials and totally charming. We were a group of seven and were very comfortable. The location is perfect! The property is beautiful and provides everything you need. We built a fire outside every day with plenty of wood waiting for both the house and outside. The location was convenient to everything in the area. We are definitely returning in the future! We are so happy you enjoyed your holiday vacation at Rio Angels! Hope you all and the dogs had a wonderful family reunion full of fun times and unforgettable memories! We look forward to having you all return to Rio Angels again soon, and wish you a New Year full of love, joy & many blessings! This was our second stay at Gabriel's cabin & loved every minute of it !!! We walked our dogs on the trail by the river & rode bikes into town . Everything is very close to town . An easy day drive to silverton & ouray for a beautiful jeep tour . Went to Durango mountain for the alpine slide . Very comfortable cabin ! Only problem is not staying long enough . Next time we're staying a month !!! My daughter's family and I made a trip from Tucson, AZ as a40th Birthday surprise for my daughter who lives in Durango. While looking for a place to stay the four nights we were there, I found this property among others that would have fit our needs. I'm so glad this was the one we booked! The pictures do not do it justice! Not only was it clean and well stocked the space inside and out are great. We made good use of the well appointed kitchen, bar-Bab-que, outside tables, and evenings around the fire pit. I loved sitting by the river and listening to the birds when not occupied with my kids and grand kids. Before we headed home I told my family I want to come back with the "whole clan" when I celebrate the beginning of my next decade! Special Thank You to Whitney for all her help in making our trip special! This was our first trip to Durango and Gabriel's cabin. We spent Christmas there with our son, daughter in law and grand babies. It was the first time they had seen snow. They really enjoyed playing in it and they enjoyed sledding. We hope to return many times more. Thank you for a great time. Rio Angels was a great vacation spot for our family of four, the house had everything we needed and plenty of room for us and our two teenagers. We loved having the river right out the back door and the privacy of being on a large, fairly secluded lot. Going back and forth to Durango for rafting, eating, shopping, etc. was quick and easy and we were close enough to other great places to see like the Mesa Verde National Park, Lake Vallecito and Pagosa Springs that the location really worked for us. We fished the Animas from the property (lots of rain this year so the river was running high and fast making fishing tough), we sat by the fire pit, watched the Durango fire works on the 4th in the rain from the top of the driveway and watched the lightning over the hills from the back deck. Overall a cool experience. Our only surprise was that the property was a little closer to the road(s) and the commercial area than we expected, it made it very convenient but not quite as secluded as we expected. It would be good to have a DVD player for the downstairs TV also so everyone could watch a movie without being in the bedroom. Either way we had a great time, the house was clean and well appointed and we would go back again. Rio Angels Estate is located just 5 minutes from downtown Durango, and has two luxurious houses available on its extensive river front property. Three ski resorts are located close by, making Rio Angels the perfect base for winter sports. Purgatory (Durango Mountain Resort) is 30 minutes, Wolf Creek is an hour away, and Hesperus (Lighted night skiing) is less than 20 minutes by car! Durango is well known for its myriad year-round activities...including great snow skiing, fishing, cycling, hunting, golf...all in a climate which boasts 325 days of sunshine per year! Durango also has a lively cultural scene, numerous five-star restaurants and wonderful boutique shopping. * Prices based on 6 person occupancy. Additional guests (2 maximum) - $25 per person per night. 10% Discount for stays of 7 nights or more.